ZANU-PF yesterday described as “treasonous” statements by Zimbabwe Defence Forces Commander General Constantino Chiwenga that the military will not hesitate to take corrective measures when they felt the gains of the liberation struggle were under threat. The party’s national spokesperson, Cde Simon Khaya Moyo, said Gen Chiwenga’s utterances were meant to incite insurrection and violent challenge to the constitutional order. Cde Khaya Moyo said Gen Chiwenga’s utterances did not represent the rest of the command element and were meant to disturb national peace and stability. “Consistent with the guiding principle of the national liberation struggle, the ruling Zimbabwe African National Union Patriotic Front (Zanu-PF) reaffirms the primacy of politics over the gun. “It is against an understanding of this abiding principle that the statement issued by General Constantino Chiwenga purporting to speak on behalf of the Zimbabwe Defences Forces (ZDF) was not only surprising, but was an outrageous vitiation of professional soldiership and his wartime record as a high-ranking freedom fighter entrusted with command responsibilities in a free democratic Zimbabwe,’’ Cde Khaya Moyo said. The statement, Cde Khaya Moyo said, was designed to disturb the prevailing peace. “Clearly calculated to disturb national peace and stability, the said statement by General Constantino Chiwenga which was not signed, and which did not represent the rest of the command element, suggests treasonable conduct on his part as this was meant to incite insurrection and violent challenge to the constitutional order,” Cde Khaya Moyo said. “Indeed, this is what happens when the gun seeks to overreach by dictating to politics and norms of constitutionality,” he added. 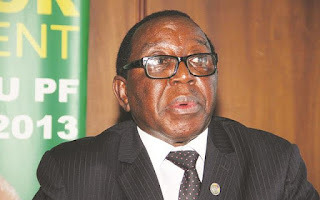 Zanu-PF, Cde Khaya Moyo said, would never submit to threats. “As the party running the democratically elected Government of Zimbabwe, Zanu-PF will never succumb to any threats, least of all those driving from conduct that is inconsistent with the tenets of democracy and constitutionalism,” he said. He went on: “By yesterday’s reprehensible conduct, it would appear that this wise counsel not only went unheeded but was flagrantly flouted in deference to factional politics and personal ambitions.